In 2015, Dr. Bruns, a retired optical physicist and 50-year amateur astronomer, got the idea that readily available, modern, amateur equipment could best the accuracy of this experiment conducted by professionals over the last century. He set his sights on conducting his own Einstein star deflection experiment during the August 2017 Great American Eclipse. Upon outlining his equipment requirements to achieve the necessary experimental precision, his search for a precision, wide field instrument led him to the flat-field, portable Tele Vue-NP101is (Nagler-Petzval APO) telescope to image the star field near the Sun during the eclipse. In a Sky & Telescope article before the eclipse, Dr. Bruns explains that he choose the Tele Vue scope because he needed “to pinpoint the centers of star images to within 0.02-pixel, those stars falling near the edges and corners of each frame must be as sharp as the ones in the center. The NP101is has a flat, color-free image plane, perfect for creating these very accurate star images, and I can adjust the focuser so that the camera remains perfectly square to the optical axis.” For the camera he selected a Finger Lakes Instrumentation Microline 8051 CCD camera. The scope and camera were mounted on a Software Bisque MyT Paramount with field tripod. This made for a compact, readily transportable system that fit in his VW hatchback — a huge contrast to the giant telescopes and fragile glass plates used to image eclipses in all prior attempts. 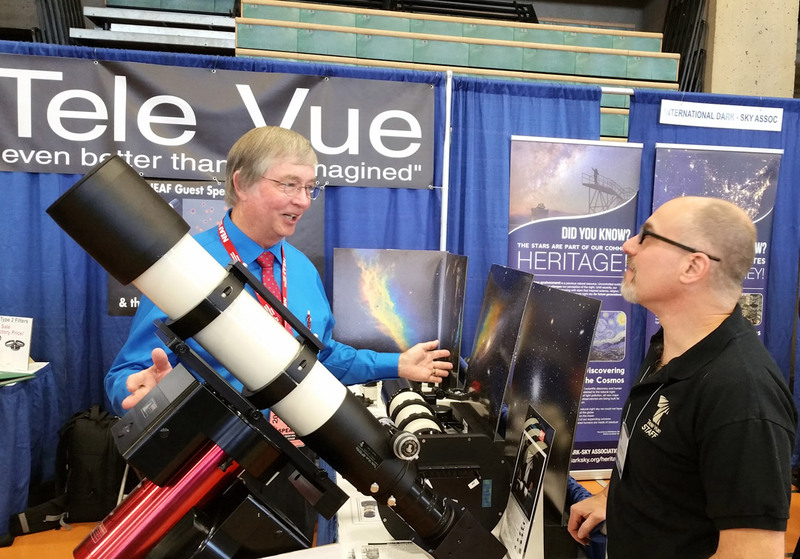 Dr. Bruns started his imaging runs in the spring of 2017, before the eclipse, by taking nighttime and twilight (to simulate star visibility in the eclipsed sky) images of the stars that would be near the sun during the August eclipse. This calibration data was used in conjunction with performance data from Tele Vue to characterize any distortion present in the system so that it could be eliminated as a variable in his images. Bruns also did some simulated data acquisition and data reduction to verify his experiment. Dr. Bruns with David Nagler. After careful planning, the actual experiment on the day of the eclipse went smoothly. There were no equipment failures or clouds that frequently beset breakthrough astronomical experiments. After months of data reduction, Dr. Bruns arrived at the conclusion that starlight passing at the very edge of the sun would deflect by 1.7512-arcseconds. Based on Einsteins equations he calculated the theoretical value as 1.7512-arcseconds — exactly the same! He admits it was a coincidence that the numbers agreed as he calculated the experimental value with an uncertainty of 3%. 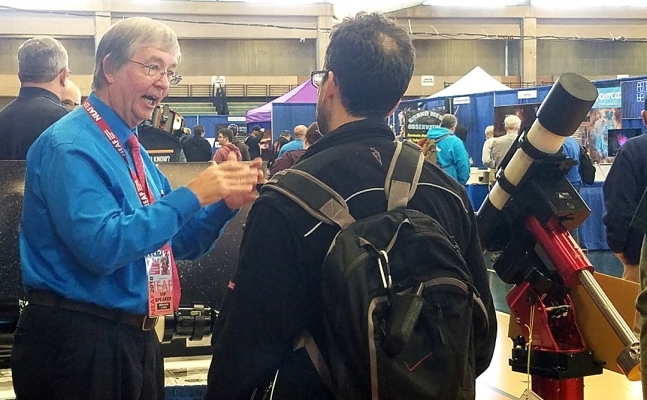 For his ground-breaking efforts conducting this experiment as an amateur astronomer, Dr. Bruns received the American Astronomical Society’s Chambliss Amateur Achievement Award. 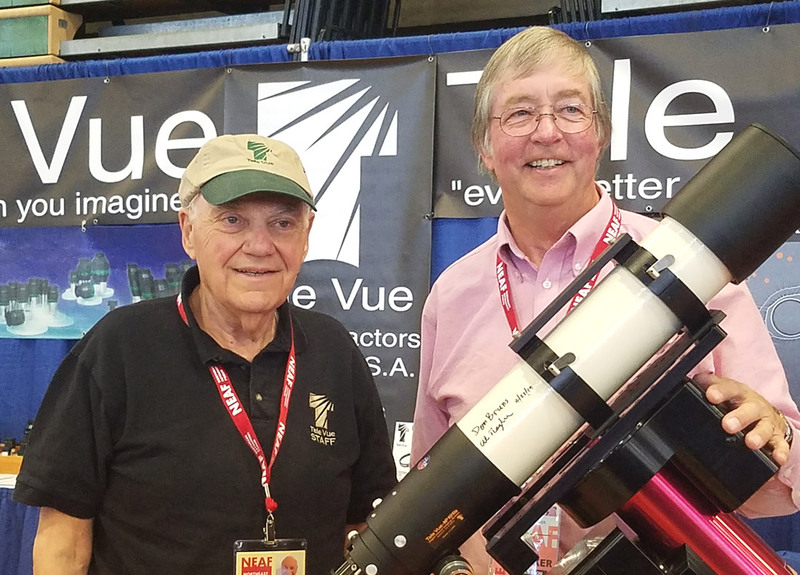 His award citation reads: “For his successful recreation of, and improvement upon, Eddington’s iconic deflection-of-light experiment during the 2017 total solar eclipse, which represents a tour de force in careful observing and calibration.” Tele Vue Optics congratulates Dr. Bruns on this outstanding achievement and thanks him for selecting our Tele Vue-NP101is refractor to have been part of it. Dr. Bruns taking questions in our booth. 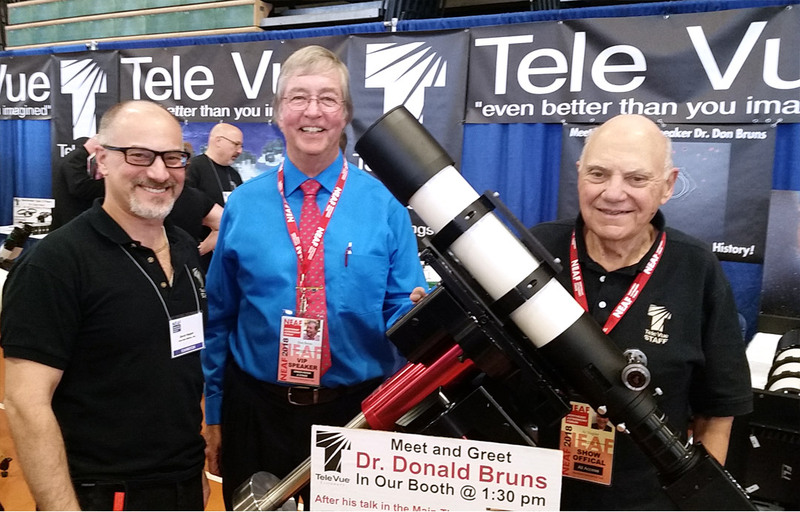 Right after the presentation, Dr. Bruns was kind enough to spend time in our booth in the vendor area. In fact, he came back both on Saturday (blue shirt) and Sunday (pink shirt). The pink shirt he wore Sunday was the same one he wore when imaging the eclipse! Dr. Bruns explains his data. We were also excited to display the actual Tele Vue-NP101is used by Dr. Bruns in our booth — along with a banner displaying the experimental data used in his calculations. 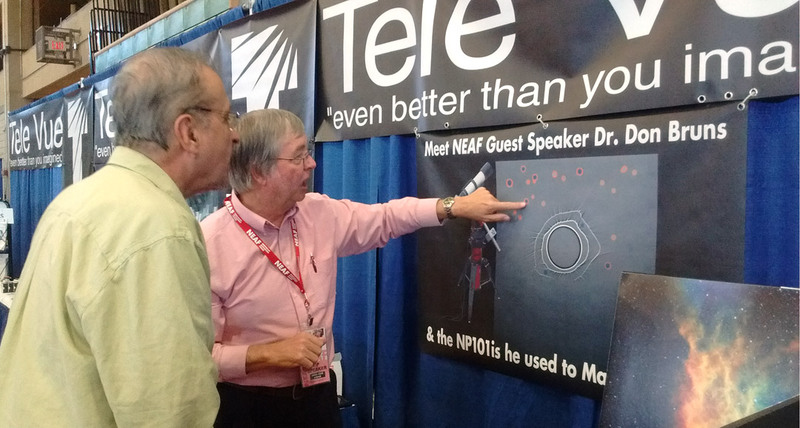 A highlight of of his Sunday appearance in our booth was his signing the telescope along with the scope’s designer Al Nagler. Dr. Bruns and Al Nagler sign the NP101is scope used for the eclipse experiment as David Nagler looks on. Al Nagler and Dr. Bruns pose with NP101is used for the eclipse experiment. You can watch a YouTube video of the signing below. 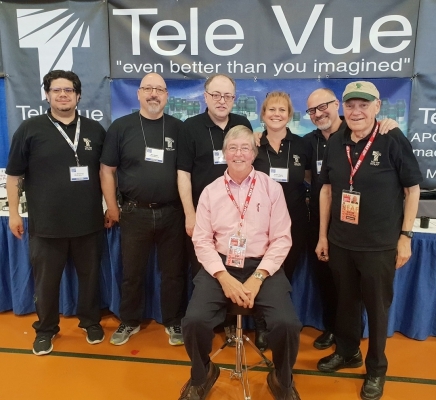 Dr. Bruns also sat for a group photo with the Tele Vue staff. Dr. Bruns with Tele Vue staff. L to R, Jon, Rick, Peter, Sandy, David, and Al. Previous Previous post: New! Bandmate Type 2 Filters! 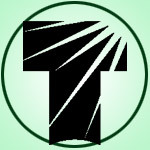 Next Next post: Jupiter Opposition & Mercury Tangles with Uranus!